A pioneer in decorative heating, Rasmussen leads the way with beautifully crafted gas log sets made from the finest quality refractory ceramic materials. Rasmussen gas log molds are created from select pieces of actual wood, reproducing the finest bark detail. Environmentally safe ceramic coatings are hand applied in a multi-step process to recreate the random complexity of real wood for a surprisingly natural finish. Rigid steel reinforcement ensures a sturdy, long-lasting log set. 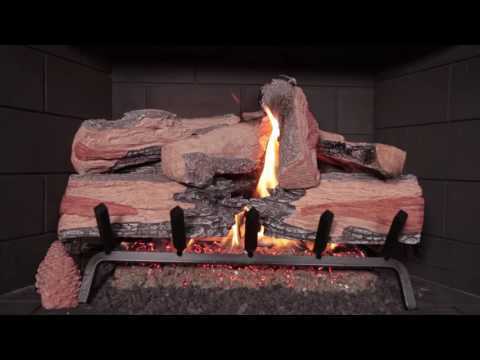 Let the heavy bark, split and charred features of the Evening CrossFire Log Set from Rasmussen bring the timeless beauty of a glowing log fire into your home. Logs Only - This set does not include a burner. Rasmussen’s Evening Crossfire vented gas log sets are reversible, which means you can choose your look. Whether you like the beautiful split wood appearance or the darker look of bark, you can’t go wrong. The front log is two separate pieces, which gives the appearance of being burned through. Really love the pine cones, which are a really fun accessory. The heavy gauge steel pan burner is baffled which relieves you of the need for a log grate. Surround the logs with embers and volcanic ash to create a truly unique pit look. Rasmussen considers themselves pioneers in decorative heating and it’s easy to see why. All of their logs are made using high-quality refractory ceramic materials. The logs are reinforced with a rigid steel which makes for a sturdy log. Match light burners are easy to operate. If you have safety concerns, a safety pilot can be added to your burner. If you have trouble with mobility or have difficulty physically getting your gas log set lit, don’t feel discouraged. Great options such as wall switches, on/off remotes, and remotes with variable flame options are available to make lighting your gas log set convenient and easy.